How to create a Lesson using the Questions with Single Correct Answer Type? You can ask a question and give multiple options but only with one possible correct answer. The user can select only one answer per each attempt. 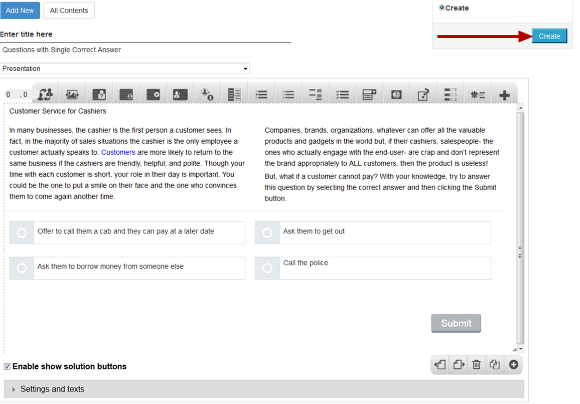 You can use this component when you want the users select only one answer out of the choices from an answers list. User selects a single answer and clicks the Submit button to submit the answer. If the user has selected the correct answer, it will be highlighted in green. Correct Feedback is shown in the Grey panel at the bottom of the screen. If the user has selected any wrong answer, it will be highlighted in red. First Attempt Feedback is shown in the grey panel at the bottom of the screen and the Submit button changes to Retry button. The user selects the answer again and clicks the Submit button. Correct Feedback is shown in the grey panel if the selected answer is correct. The correct answer is highlighted in green. Second Attempt Feedback appears in the grey panel if the selected answer is wrong. The button changes to Show. 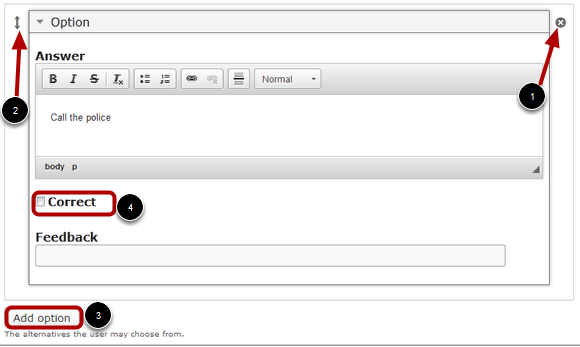 If you click Inline Feedback checkbox, the feedback will appear next to the answers in a row. In our case, we need to make sure that it is disabled since we want the feedbacks appear at the bottom in the grey panel. Since we want the user to select only one answer, we need to check the Single Choice checkbox. Make sure it is checked. Similarly, Correct Feedback is the feedback that appears when the user selects the correct answer at anytime. This is also the feedback that will be shown when the user clicks the Show button after selecting any wrong answer in the second attempt. 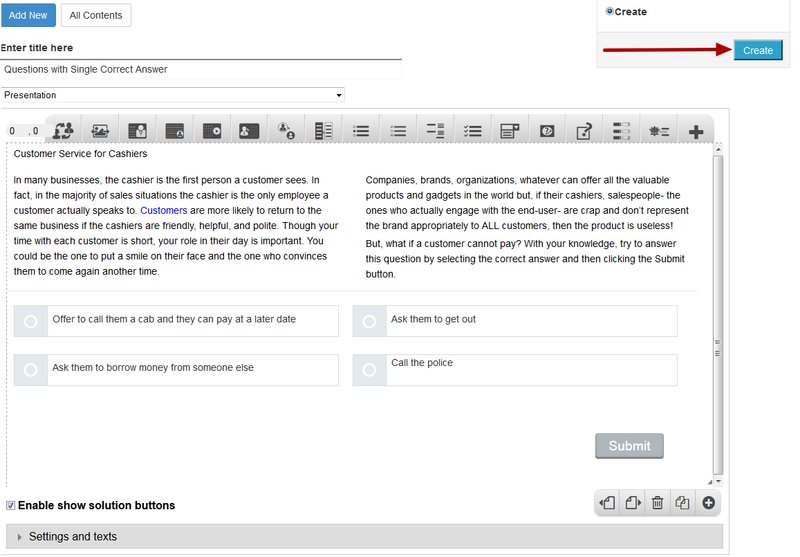 Just type the contents of the page in the Correct Answer Feedback field as shown in the above image. 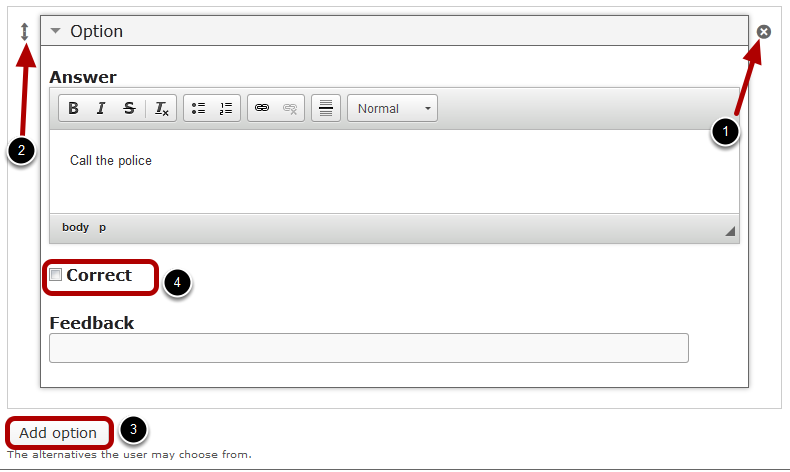 Under Available options, we add the answer alternatives the user can choose from. Two empty available options are listed by default. Start entering the answers in the Answer fields. If the answer is correct, check the Correct  checkbox as shown in the below image. Make sure that you check this checkbox for only one answer.